In this multi-day lesson, students use the problem solving process from Unit 1 to create a platform jumper game. They start by looking at an example of a platform jumper, then define what their games will look like. Next, they use a structured process to plan the backgrounds, variables, sprites, and functions they will need to implement their game. After writing the code for the game, students will reflect on how the game could be improved, and implement those changes. Students have already learned all of the programming constructs that they need to make a game. This lesson reviews many of those concepts while introducing them to a structured process that will help them to manage the work. It builds on the use of the Project Guide in the previous lesson by having students complete more of this project guide independently before using it to build a game. This activity prepares students to write their own game from scratch for the final project. Prompt: The Problem Solving Process helps us work through all kinds of problems. Think about the problem of building a larger piece of software, like the game we built in the last lesson. What did each of the 4 steps look like? Why were they important? Goal: Students should share their thoughts but if it doesn't come up naturally then suggest the examples provided. This discussion will motivate the use of the project guide for building a game later in the lesson. Define: Figuring out what you want the game to look like, how it should work, who will play it. Prepare: Plan ahead what your code will look like. Decide on a structure for your game. Try: Write the code following your plan. Reflect: Test your code, play the game to make sure it works, get feedback from other people to make the game better. When you build software, the problem solving process can be a helpful guide. Obviously we need to write the code, but being careful to define what you want to build, making a good plan to build it, and reflecting afterwards on how to improve it are all part of making good software. Today we’re going to use this process to make a new game. We're going to be building a jumper game today. You'll have a chance to play a sample game, then plan out how you would create the game on your Project Guide. Move students to Code Studio. On the first level they will be find a game but will not be able to see the code. They should play the game and follow the instructions which ask them to list the variables, sprites, and functions they think are necessary to create this game. Circulate: Students should complete the project guide in the style of the one they saw in the previous lesson. They will likely want to keep the game up as they try to determine the behavior each of the sprites will have. Share: Students share out their plans for making the game. Reassure them that there are many correct ways to make the same piece of software, and that they will have a chance to try out theit ideas in code studio. Making the game will take at least two class periods. If there's not enough time for all students to finish the lesson, groups of students can work to to code different aspects, then share their code with each other. For example, one group could work on the platforms, one on the stars, and another on the player. Student who have finished early can choose more challenges from the later levels. Students work in pairs to create the alien jumper game. Students have an opportunity to improve their game after being exposed to two other versions of a platform jumper. Share: Students share their games with their classmates. The game on the left is an example of a platform jumper. Press "Run" to play it. You can make the alien jump with the up arrow, and move it to the left and right with the arrow keys. You score by collecting stars, and if you score high enough, the background will change. You already know how to use all the blocks you need to make a game just like this one, and you'll be making your own platform jumper in this lesson. In the next several levels, you'll be building a platform jumper game. Before you move on you'll need to look at the Project Guide for this project. Wait for instructions from your teacher before clicking to the next level. There is also an empty function named background2. (Show me where) You will need to fill that function with new code to make a different background, then test the code by calling the function inside the draw loop. Read the code for background1. Fill the background2 function with new code for a second background. Test your background2 function by calling it inside the draw loop. Hint: It's much easier to copy, paste, and make small changes to your code in text mode. Now that you've created your backgrounds, you'll need to choose when each background is drawn. For that, you'll need a score variable to hold information about your player's score. You should always give your variables a starting value at the very beginning of the program. That way, they are available for any code that comes after. Set the score equal to 0. Inside the draw loop, use an if statement and your two background functions to draw your background according to your score level. 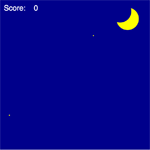 Test your code by changing the start score to 100, then running to code to see whether the background changes. Challenge: If you have a third background, you can click the plus sign at the bottom of the if block. Another space will appear for your third background function, as well as a place to check the score again. You'll also need a scoreboard so the player can keep track of the score. There's already a showScore function written, but it only shows the text "Score" and not the actual score. (Show me where) You can see an example of a working scoreboard in Lesson 16 Level 9. Read the code in the showScore function. Call the function inside the draw loop, right after you draw the backgrounds. Use the text block to display the score at the top of the screen. Now that you have your background and your variables, it's time to create your sprites. Usually, it will be easiest to start with the sprites that are part of the environment, such as your platforms. The sample game had two platform sprites, but you'll make just one first, then test it before copying and pasting the code to make the second. Look at your worksheet and choose a platform sprite to create. Use the setAnimation and velocityY blocks to give your sprite the correct image and downward velocity. Test the sprite to make sure that it's moving in the correct way. You might need to adjust its velocity. Hint: The sprite will go off the screen and not come back. You'll make it loop back around in the next level. Right now, your platform sprite moves down, but it doesn't loop back up to the top of the screen. You can look at Lesson 15 Level 13 to see an example of a sprite looping around a screen. Use the function block to create a loopPlatforms function at the bottom of your code. Use the if block inside the function to check whether the platform has gone off the bottom of screen and, if it has, move it back to the top of the screen. Call the function inside the draw loop, in the "update sprites" area. Run the code to test your sprite. Hint: What will platform.y be when the sprite moves off the bottom of the screen? What should platform.y be when you put it back at the top of the screen? Making a second platform will be easier than making the first, because you can copy and paste a lot of the code, then make a few small changes. This is a lot easier in text mode, so be sure to try it out if you haven't already. You'll need to copy two parts of your code: the part at the beginning where you made the platform, and the part in your loopPlatforms function, where you looped the platform back to the top of the screen. Copy the code you used to create the first platform sprite (createSprite, setAnimation, and velocityY), and paste it directly beneath the original code. Change the names of the sprite in the new lines. For example, if you named your original sprite "platform", you could name this one "platform2". Change the starting position of your new platform sprite. Inside your loopPlatforms function, copy the if statement, then paste it directly underneath the original code, inside the function. Change the sprite name in the new lines of code. Run your code to test it. Challenge: You can make your platforms appear at random x positions when they loop back to the top of the screen. Next, you need to add the items that fall from the top of the screen. These move just like the platforms, but faster. In order to make the game more interesting, the items start at a random location above the screen. For the sample game, the item's x position is a random number between 50 and 350, and the y position is a random number between -30 and -60. Use the createSprite block to make an item sprite in the "create sprites" section of your code. Use the randomNumber block inside your createSprite block to start the item at a random x and y position. Use setAnimation and velocityY to give your sprite the correct image and make it fall from the top of the screen. Now that your item is falling, you can add code to loop it back to the top. This is similar to what you did for the platform sprite, but the item sprite will loop back to a random x and y location when it goes to the top of the screen. Create a loopItems function that uses an if block to check whether the item sprite is off the bottom of the screen, then sends the item back to a random x and y position, just as it did when you first created the sprite. Call the function inside the draw loop. Next, you'll copy and paste the code for your first item to create a second item. Remember that this is a lot easier in text mode, so be sure to try it out if you haven't already. You'll need to copy two parts of your code: the part at the beginning where you made the item, and the part in your loopItem function, where you looped the item back to the top of the screen. Copy the code you used to create the first item sprite (createSprite, setAnimation, and velocityY), and paste it directly beneath the original code. Change the names of the sprite in the new lines. For example, if you named your original sprite "star", you could name this one "star2". Inside your loopItems function, copy the if statement, then paste it directly underneath the original code, inside the function. Now you can create your player sprite. Just like the item sprites, the player sprite will fall from the top of the screen. Unlike the items, your player sprite will get faster as it falls, just like real falling objects. This is what allows it to jump up, and fall back down. Use the createSprite block to make a player sprite with the label and starting position that you put on your worksheet. Use setAnimation to give it the correct image. Create a playerFall function that makes the sprite fall from the top of the screen. The code inside the function should use velocityY in a counter pattern, just as when you made the falling rock in Lesson 17 Level 4. Call the playerFall function inside the draw loop. Next, you should add user controls so that you can move your player around. Your player needs to move to the left when the left arrow key is pressed, to the right when the right arrow key is pressed, and jump when the space bar is pressed. Create a new controlPlayer function in the "functions" area of your code. Inside the controlPlayer function, use the if, keyDown, and sprite.x blocks to make your player move to the left and right according to the arrow keys. Look at Lesson 12 Puzzle 7 for examples. Inside the controlPlayer function, use the if, keyDown, and velocityY blocks to make your player jump when the up arrow is pressed. Look at Lesson 15 Puzzle 11 for an example. Call the controlPlayer function inside the draw loop. Run the game and test your code. The last part of making your game is programming the player interactions with the other sprites. First, your player needs to land on the platforms. Create a playerLands function and add it to the "functions" area of your code. Inside the function, use the collide block so that your player can land on both the platforms. Run the code to test your function. Last, you'll want your player to collect the items falling from the top of the screen. Create a collectItems function and add it to the "functions" area of your code. Use the if and isTouching blocks to change the x and y position of the items when the player touches them. You can look at the loopItem function for clues in how to reset the item position. Inside your if statement, add a counter pattern that will increase the score every time the player touches an item. Look at Lesson 16 Puzzle 9 for an example. Call the function inside the draw loop, in the "update sprites" area of your code. Here's another example of a platform jumper, but it has a few more features. You can use it to get ideas to improve your own game. For example, there is a coin sprite that gives the player an extra life. Choose one or more of the following changes and add them to your game. Choose new animations for your player, platform, and items. Make it impossible for your player to go off the left or right of the screen. Add a different type of item for the player to collect or avoid. Add a variable that keeps track of how many lives the player has, and end the game if the player runs out. Here's another example of a jumper. In this one, the items get faster when they fall, and bounce off the platforms. Choose one or more of the following changes and add them to your game. Make your player's animation change direction when the player changes direction. Add another background and make it appear when the score gets even higher. * Make your items interact with the platforms in some way. Improve your game by adding in two or more of the features you saw in the last two examples. You can use the list below to help you. Choose new animations for your player, platform, and items. Prevent your player from going off the side of the screen. Add a different type of item for the player to collect or avoid. Add a variable that keeps track of how many lives the player has, and end the game if the player runs out. Make your player's animation change direction when the player changes direction. Change the player to only jump when it is on a platform. Add another background and make it appear when the score gets even higher. Make your items interact with the platforms in some way.